Graveside Services for Holly, Colorado resident, Julia “Judy” Norton will be held at 1:00 p.m. on Tuesday, March 26, 2019 at the Holly Cemetery in Holly, Colorado with Pastor Kathy Leathers officiating. Visitation will be held from 10:00 a.m. until noon at Valley Memorial Funeral Chapel in Holly on Tuesday, March 26, 2019. Julia Violet (Kincaid) Norton, affectionately known as Judy, was born on October 15, 1923 in LaPorte, Colorado to James and Ida (Buchuswix) Kincaid. 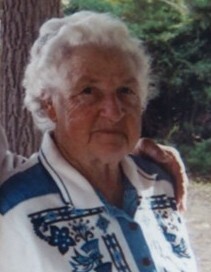 She passed away on March 19, 2019 at Holly Nursing Care Center in Holly, Colorado at the age of 95. Judy received her education in Laramie, Wyoming while living in an orphanage after the passing of her mother and her dad falling on hard times. She recalled time spent there and of the discipline and tasks assigned. This may be why Judy characterized an attitude of persistence throughout her life and never discarded anything, anticipating that it might be used later. Judy was united in marriage to William "Bill" Norton on April 23,1948 in Fort Collins. Her son, Tom was adopted by Bill and their family was complete. Bill, Judy, and Tom returned to the family farm north of Holly where Bill farmed with his father and operated his own farm in Cheyenne County. Together Bill and Judy farmed and raised cattle, turkeys, sheep, and chickens through the years. Judy is survived by her four grandchildren, Randy and wife, Sherry Norton of Highland Ranch, Colorado, Lisa and husband, John Gurley of Gorham, Maine, Jeff Norton of Durango, Colorado, and Troy Norton of Broomfield Colorado; several great grandchildren; other relatives and special friends, Donnie and Suzie Seufer and family.